Dyce Kimura is proud to announce a special Christmas discount for a package gift of Skype guitar lessons. Looking for a unique Christmas gift for your loved ones? Finding that perfect present can be tough, so Dyce Kimura is proud to announce a package gift of Skype guitar lessons. Enjoy a special 5 percent discount with the mention of this article as you give the gift of music. “So many young men and women want to learn music and don’t know where to begin,” says Kimura. “Parents can give a present that students won’t forget. Music is a lifelong gift that students truly appreciate.” While other gifts fade with time, music gives students a skill that they’ll always treasure, insists Kimura. Known best for his Skype guitar lessons, Kimura is a teacher who is dedicated to helping others discover their passions and talents. Kimura is a professional musician who has recorded in the studio, performed in many live events, and has even written and arranged music. Kimura is known for his passion, personal attention, and excitement for his students, and he states that teaching is one of his life’s most rewarding experiences. “You really get the sense that he cares about you as a musician and a person as well,” says one student. With years of experience playing for church services, Dyce Kimura is proud to offer Skype Christian guitar lessons. Whether students are aiming to lead worship or simply want to learn songs by their favorite Christian artists, Kimura is dedicated to helping them achieve their goals. This is one of the most popular gift packages available. As the holiday season kicks into gear, Kimura hopes that parents will consider giving the gift of music. “It’s truly a gift unlike any other,” says Kimura. Students enjoy Kimura’s ability to engage with them personally, even over a digital medium. Skype music lessons allow students the opportunity to enjoy traditional lessons without the hassle of travel. Online music lessons are truly for the convenience and benefit of the student. Save 5 percent on a package gift of Skype music lessons with the mention of this article. 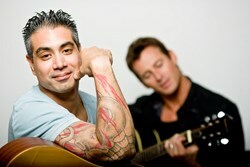 Dyce Kimura is a professional musician and guitar teacher in Fort Lauderdale, FL. His lessons are available to everyone online.